Gavin MacLeod, who owns a number of Alex's artworks, has acquired another unique piece to add to his collection - an elaborately detailed work that Alex recently completed using mixed media. 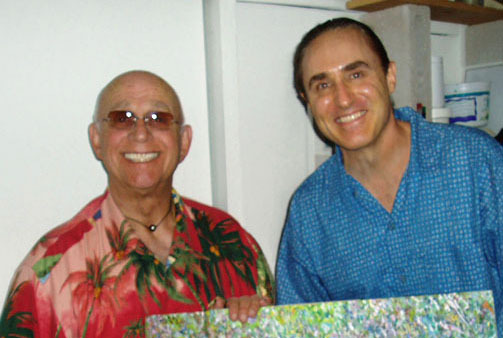 After hanging the work on his wall, last month Gavin wrote "it is an honor to be associated with Alex and his work; he is one of the most gifted artists in the world." The photo above was taken during one of Gavin's visits to Alex's studio in Hawaii. Gavin has starred in many TV and Hollywood productions but is perhaps best known as the "Captain" on The Love Boat, as well as for playing one of the lead roles on The Mary Tyler Moore show.